Author: Hannah Ryder, Deputy Country Director, UNDP China. It’s an obvious statement but a while back, even American Vice President Joe Bidden forgot it when he said: “There’s no reason the nation of Africa cannot and should not join the ranks of the world’s most prosperous nations”. Having worked in development for over ten years now, I think recognizing the wealth of diversity across the African continent – different languages, cultures, economics – is key. There is no way you can understand the different problems facing the continent – and required solutions – unless you recognize its wealth of diversity. But working in China I now have the complete opposite problem: I now have to remind myself that while China is indeed a country, its scale and experience is not like that of any other country. China is almost a continent. For example, by 2015, China is projected to have 3000 kilometers of urban rail networks, and by 2020, 5000. That’s half the size of East Africa’s entire rail network – urban and rural, let alone just in cities. Over the next 10-12 years, the population of rural to urban migrants within China is forecast to be almost the size of the USA’s entire population. There is also scale in China’s policy. For instance, according to a report UNDP China recently commissioned, China’s basic pension scheme covers 820 million people, and 20 million more people per year are expected to become eligible for it, meaning by 2030 it could cover the equivalent of the entire African population. This scale makes China an excellent – and unique – partner for learning from on development. Since 1990, China has brought 600 million people out of poverty. But to do this, given its own scale and diversity, China needed a huge and varied number of policies and approaches. 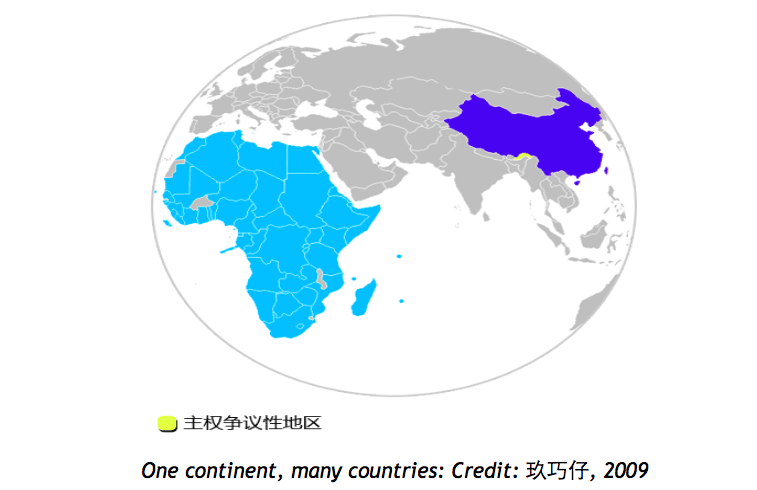 This is where the facts that Africa is not a country and China is almost a continent come in. Here’s why. One of UNDP China’s key stakeholders is an organization called the International Poverty Reduction Center in China (IPRCC), which started up in 2005, to help share China’s experience of poverty reduction and development with other countries. Since then, IPRCC has organized 60 training workshops for 1450 trainees from 97 countries. And IPRCC is not the only organization that delivers this kind of training. For instance, with the National Development and Reform Commission (NDRC), I recently helped to open a three-week long low-carbon development workshop. There were around 80 officials at the workshop – from Zimbabwe to Ethiopia – all from various ministries in their home countries. These workshops are held twice a year, and many other Chinese ministries hold similar thematic workshops. In fact, China’s recent 2014 White Paper on Foreign Aid provided statistics that suggest that between 2010-2012 around 1.5-2 seminars per day of around 25 officials were held! I’m sure very few other countries in the world could manage this! Yet the challenge of running such workshops, for such a diverse audience, is huge. It makes attracting the right participants who will be in charge of deciding or implementing policies difficult – because that takes time to investigate and go back-and-forth on with stretched Chinese offices in recipient countries. It makes tailoring the workshops to varied participants to make each part useful very difficult – as this might require re-design of the agenda or changing partners for various field-trips. And critically, it makes follow-up of the workshops with individual queries or ideas for on-the-ground projects very complex. On return to their recipient countries, participants can find it hard to create active partnerships with China. Yet scale is good. Scale is needed, if poverty is to be reduced around the world. So how can China balance its scale with tailoring to a diverse audience? Can China shift to meet the targets for numbers of people trained but also deliver more long-term results? The fact is, although China is one country, being almost a continent, it has a great deal of diversity within it. It has potential to vary and adapt its training programmes. So UNDP is supporting China – and the IPRCC in particular – to try this. One example is a workshop we hosted a week or so ago, with a few mayors from Bangladesh. The mayors had visited China previously, and expressed interest in learning more about a particular service that local governments in China often use, called “one stop shop” centers. We helped IPRCC follow through this request, and tailor the workshop to help the Bangladeshi delegates work out how to adapt the “one stop shop” model to their situation, there and then. We can’t be sure whether the mayors will actually set up the centers, but we think there is a much higher likelihood of this happening now, and our office in Bangladesh will remain in touch with them to support them if they decide to go ahead. These new adaptive approaches are often suggested as useful for OECD aid donors. But China, being one country but almost like a continent, really has potential to excel at it, as China has experience as varied as the African countries it partners with. Experimenting with (or piloting) a shift to a more tailored approach, plus following-up through our global reach – is something UNDP can offer to China, but more importantly to those countries – including in the diverse African continent – that want to learn from China’s experience to reduce poverty at home, and deliver long-term results. What can NGOs learn from the private sector? The not-for-profit sector is afflicted by a strange condition known as ‘private sector envy’. This is the unshakeable belief that not-for-profits are inefficient, bureaucratic, and boring, while the private sector is fast-moving, quick-thinking, and innovative. This deep-seated insecurity has worked its way deep into major donors; for example, DFID writes ‘business cases’, worries about their ‘commercial model’, and seeks to ‘maximise their investment’. This is wrong for two reasons. Firstly, the not-for-profit sector can be hugely efficient. I started my career working for a small NGO in West Africa. With just five staff and unrestricted funding, it was innovative, impact-orientated, and a joy to work for. At a larger scale, the public sector has a long and distinguished history of innovations; the internet is a recent good example. (Thanks, US military!) In turn, the private sector can be quite incredibly inefficient, as anyone who has ever tried to change their gas supplier can testify. More importantly, private sector envy often ignores the relative constraints and incentives of the public and private sectors. I realised this when I switched from working from large (and inefficient) charities, to private sector consultancies implementing donor-funded projects. Being afflicted by private sector envy myself, I honestly expected the private sector to be more efficient than the public sector, and it was quite a shock to find that it was just as bad. After the initial frustration had subsided, I realised that the reason was simple – as a contractor, the private sector consultancy was now labouring under exactly the same incentives as the charities. They were risk-averse because the donor punished failure. They didn’t care about monitoring and evaluation because they didn’t want to uncover any negative news which might jeopardise their next bid. The HR department was useless because – well, HR departments are always useless. When the private sector is more efficient, it’s often because they have clearer incentives and clearer metrics of success. In the public sector, by contrast, incentives are murky and often misaligned. Government bodies often want to spend their allocated budget and satisfy domestic lobbyists or constituencies, charities often want to get more money and expand. There is no simple metric of success which can be agreed on, unambiguously measured, and used to drive performance. So trying to make the not for profit sector “more business-like” is a mistake. In trying to transplant practices from the private sector into the public sector, you risk getting the worst of both worlds. Management by results is a good example. Although better monitoring, evaluation, and tracking of results is certainly needed, most development projects cannot be managed by a simple dashboard of indicators. Current results management practices risk perverse incentives – encouraging a focus on the short over the long term, for example – and could reduce the intrinsic motivation of many working in the sector. Instead, we should take inspiration from good practice wherever we find it – whether in the public sector, private sector, or behind the back of the sofa. We should pay attention to the incentives that programmes face, and recognise that these are mixed, ambiguous, and hard to set. We should measure success – but recognise that we can’t always attribute it and use it to drive programme performance. Finally, we should fire all HR departments.